With whisky, kilts, bagpipes and ceilidhs (pronounced as keh’li in Scottish Gaelic), there is much that is unique about Scotland that people love. Where else is there a monster at the bottom of a loch, or the prickly thistle used as a national symbol? Add tug o' war to grand castles, train rides through majestic landscapes, the mainland coastal beaches and 709 islands to explore, and history trails to follow inland, it’s no surprise that so many people love Scotland. Scotland is full of dramatic natural beauty and man-made wonders which would take a lifetime to explore. Scotland’s landscapes, lochs and magical mountains have been inspiring artists for centuries. With a population of just over 5 million (less than in the city of London) you can enjoy unspoiled countryside, mountain and coastal routes offering tranquillity, and some rare and wonderful wildlife spotting. There are picturesque villages, historic and atmospheric towns from Edinburgh castle, perched high on an ancient craggy stronghold overlooking the capital city, to the fifteen century Rosslyn chapel, surrounded in myth and legend with its ornate and mysterious stone carvings and symbols, and the Ring of Broadgar, one of the finest stone circles in the UK that dates back to around 2500 – 2000 BC. 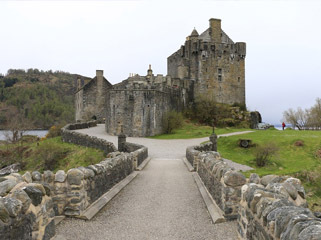 The history of Scotland is as fascinating as it is complex, stretching back thousands of years. There were tribal Celts and ancient, face-painted Picts, Roman conquerors and fearless red-headed Vikings, fallen monarchs and powerful warrior-royals, noble clansmen, great explorers, philosophers and inventors. All have left their mark on Scotland. There are ancient and mysterious standing stones, fine castles and lavish stately homes, striking architecture, derelict fortresses, world-famous feats of engineering to name just a few. From the Scottish Borders to Orkney and from Fife to the Isle of Skye, fierce battles were won and lost, lasting unions were forged, and new discoveries and world-changing inventions were made. Highland Games take place across Scotland and are a unique mix of sports and culture. The field and track events, piping and Highland dancing competitions and 'heavy events' like the tug-o-war, the hammer throw and tossing the caber show you just how strong Scots and their communities are. Then there’s the Scottish game Shinty, believed to have originated from warriors training for battle. You can enjoy more well-known sports, play tennis on the most remote court in the UK, raft a grade 5 river and more. The people of Scotland are friendly and extremely helpful. You can rely on the Scots to find something humorous, even in the very challenging situations. Neighbours are friends, watching out for each other and helping each other when they can.